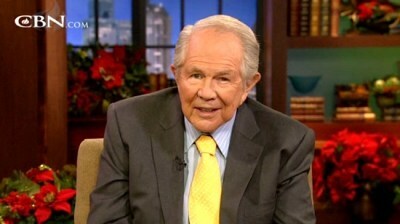 Televangelist Pat Robertson has said on Thursday's edition of The 700 Club with co-host Kristi Watts that people thinking of adopting children should be cautious about taking in those that have been sexually abused or deprived of food for risk that they may turn out to be "weird." The conversation stemmed of a letter that co-host Watts read concerning a woman who complained of an unsuccessful dating life due to her three adopted daughters, who all came from different countries. While Watts suggested that the men turning her down for that specific reason were the problem, Robertson insisted that they are not wrong. "A man doesn't want to take on the United Nations, and a woman has all these various children, blended family, what is it – you don't know what problems there are. I'm serious. I've got a dear friend, an adopted son, a little kid from an orphanage down in Columbia. Child had brain damage, grew up weird. And you just never know what's been done to a child before you get that child. What kind of sexual abuse has been, what kind of cruelty, what kind of food deprivation, etc. etc." the televangelist said. Robertson continued: "You don't have to take on somebody else's problems. You really don't. You can help people – we administer to orphans all over the world, we love helping people. But that doesn't necessarily mean that I'm going to take all the orphans around the world into my home. "Ok, let's take the next question – I'm in trouble," he concluded. Recently, Robertson also stirred up discussion when he commented on the Wisconsin Sikh temple shooting a week and a half ago, and suggested that such violence stems from people who "hate God." "People who are atheists, they hate God, they hate the expression of God, and they are angry with the world, angry with themselves, angry with society and they take it out on innocent people who are worshipping God," the televangelist offered.